← Lyra’s Latest: Where’s the Poop? After what felt like a winter without end, spring has finally arrived. I typically expect November and early December to be the busiest time of the year. For the most part, I don’t think of the holidays as something to survive, but when they are over, January seems indulgently quiet. A lady farmer, who lives across the street from the Waldorf school, once told me that January is the one month she relaxes. With the crops harvested and slaughtering season completed, it is too early to sugar the maples or prepare next season’s crops. Sure, there are animals and machinery that need tending, but mostly life is as quiet as snow falling on a windless day. Then spring hits and there is no rest for the weary, be they farmers or mothers and I don’t know why, but it surprises me every year. Last spring, we had an unusually warm March, and found ourselves in our gardens seemingly moments after ski season had ended at the local slopes. It was our first spring in the new house and we abruptly discovered that the yard and gardens had been cursorily tended for a couple of years. Translation: an abundance of weeds of all varieties—milky, woody, low to the ground and high to the sky—appeared as if by magic after the first warm days that March. Pregnant with Lyra, I was not much help in the garden. I trimmed dead branches off of the hydrangeas but otherwise mostly pointed out the weeds to Max because bending over made my heartburn rise. At the end of our driveway, Earth N Wood landscaping company dropped mountains of mulch large enough to be seen on Google maps. Seriously. For the rest of the spring and summer, Max pulled weeds, moved plants, mulched beds and ripped up English ivy, which grows with the destructive rapidity of the title character of The Blob, the 1958 Sci-fi movie classic (extending the metaphor: Max=Steve McQueen). The long summer turned into a warm autumn and I thought I’d never get Max back into the house. But as I mentioned in What We Keep, finally in December, we resumed tackling the ongoing project of merging the possessions of two households into one. For this reason, I was not entirely unhappy to see winter linger with hopes of extending our focus on building shelves, emptying boxes and taking things to Goodwill and Habitat for Humanity’s ReStore. Larger items, or things we haven’t decided whether to keep or part with, have been hauled to the back garage for re-evaluation in the summer when we work on de-cluttering the garage. I imagine some day our spare time will not be primarily pre-occupied with managing our possessions as it has been for the past two years. But I cannot predict when that day will arrive. And I ask myself if a deadline is in order. Before the weather turned warmer, however, our weekends no longer found us like ants busily working in a nest while the frigid winds blew outside. Since Claude came home for his spring break in March, all of us have been pulled back to life outside of our home. Annual spring benefits for our favorite non-profits started popping up like dandelions in the lawn and last week alone, three were on our calendar (we made it to just one). Track season began at the Waldorf school and, as all parents who’ve been there know, any sport that employs the word “meet” as opposed to “game” is a sport that will relieve you of an entire day every weekend of the season. Tax season took away at least two of our weekends. And through it all, Lyra has at least one appointment a week with her doctors or therapists or county caseworkers or the Down syndrome clinic. In order to manage our schedules, emails go unanswered, calls unreturned and spontaneous get-togethers can’t happen. I start each day by looking at the Google calendar. And when I forget to, as I did this past Monday, I unexpectedly found the Summit County DD case worker and physical therapist on my doorstep at nine in the morning. Thank heavens I was dressed. For me at least, it’s been hard to find my balance these past two months. I think of a quote I recently saw: Make sure to meditate at least fifteen minutes a day unless you are busy. In which case, meditate an hour a day. I smiled when I read this knowing, however ironic, that it is true. During these hectic days, meditation is like a staff planted firmly in the earth, a pole that does not stop the chaos, but rather allows me to stand still and observe the chaos without getting swept away by it. I am reminded of the wizard Gandalf who powerfully pounds his staff on the ground with one swift movement as he forcefully tells the demonic balrog, “You shall not pass!” Gandalf does not appear to kill the balrog, but he does prevent it from consuming his friends, insuring that they continue on their journey. In one of my earliest posts, I described the mom-blogs that intimidate me with stories and pictures of serene adults with sweet children in clean (handmade) clothes making butter with the milk from the goats they keep in their yards while their kitchens look as organized as Martha Stewart’s but more artsy, an aesthetic cross of Waldorf schools-Garnet Hill catalogs-Merchant Ivory films. Those moms probably don’t forget to go to the monthly meetings of their Down syndrome support group. Certainly not two months in a row. Nor do they forget to patch their daughter’s lazy eye (I won’t say how many times) and I imagine they do an hour of physical therapy three times a day so that their child with Ds meets all the “typical” baby benchmarks, like sitting up at six months. Those moms don’t ask with panicky voices at 5:30 p.m., “What are we going to feed everyone for dinner?” because they have organic and delicious meal plans extending weeks in advance. And while their kids may occasionally pull outfits out of a basket of clean laundry waiting to be folded, I doubt they ever dig into the dirty laundry to seek the least muddy pair of pants to wear to school that day. True Confession: I sometimes think about what my life would be like if I only had one child. Or two. Or three. Or four. I consider what I would be doing with my days if my only child were away at college. Or if I had just one at home and the other at school, and down the list I go. I don’t think of it often, nor do I dwell on it when I do. This in no way means I ever wish to be without any of my children in this life and pray that they all die after I do, because to lose any of them is something I do not ever want to imagine, let alone experience. No, when I think of life with fewer children it is in the way Robert Frost describes life in “The Road Not Taken.” Frost acknowledges that our choices form our lives and wonders how different choices would have forged a different life. Possibly, I wonder, even molding the person so differently as to make him or her someone else entirely. In the film Sliding Doors, Gwyneth Paltrow’s character has two different lives based upon whether she misses or catches her train to work one morning. What I do know is that last year, before I had Lyra and I was working at the Waldorf school, I was not writing with any regularity. For a number of reasons, she keeps me at home and I make it a priority to write every week as much as I can. Our lives at Whoopsie Piggle, the name of our home as much as this blog, continues to shape us just as we shape it. Our budding naturalist, Jules, has been eager to transform our yard and gardens to attract a variety of birds using native plant species. 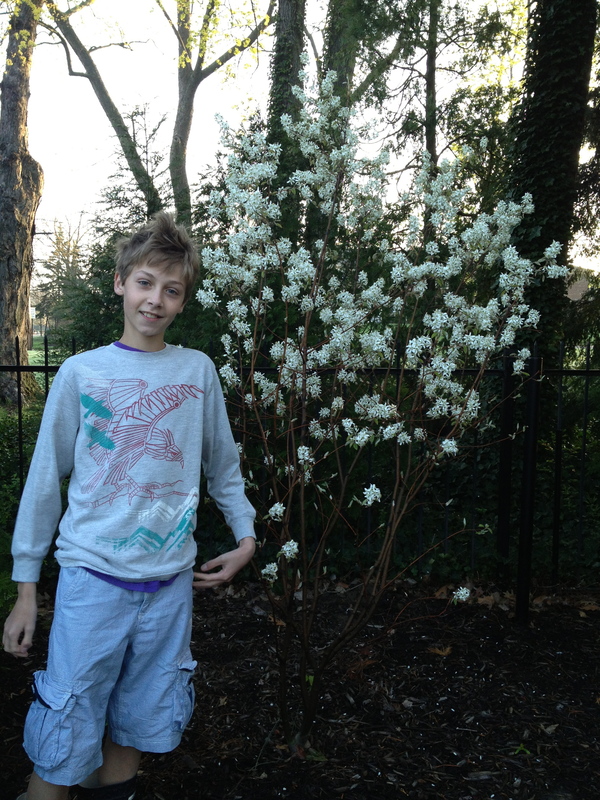 Max is his willing cohort in this venture and last fall they found a beautiful serviceberry bush on sale at a local nursery and Jules contributed $30 of his own money towards its purchase. It is now blooming and we are all eager to replace more non-native species with serviceberry bushes, spicebushes and red buds. But it is primarily Jules and Max who plot out and execute their now mutual dream of having a sustainable garden filled with native species, mirroring their own relationship in which stepson and stepfather are no longer foreign to one another but belong to each other as families can. I enjoy being able to help in the garden this year with Lyra often nearby on a blanket. Leif, who turned three in February, already loves the yard where his dad built him a big sandbox last year. We had been trying to decide where to put a swing set that a friend has offered to us for the price of taking it out of her yard when then Hurricane Sandy took out two trees in the backyard. Using his new chain saw, Max is clearing the way to make our park-like yard even more kid friendly. With Claude home and helping, it won’t be long before we have our own playground. With Claude home, the large house is more full, but not entirely. We keep one bedroom as our guest bedroom. The plan is that one day it will be Lyra’s bedroom. With lavender walls and white trim it is a cozy room that is filled with afternoon sunshine and has its own bathroom where mid-century black and mauve glass tiles line the lower half of the walls. One friend in particular regularly comes over for dinner and stays late knowing she can sleep over in the guest suite. Early on, she stayed with us for a few months when she was between apartments. Today we are awaiting the return of our friend, Nancy Wolf. Several years ago, Nancy left Akron to move to California where she followed some of her dreams. Now she is returning because her grandchildren are here, one of whom was born last December. While she resettles in our little city, Nancy and her two Labrador Retrievers will be staying with us. Will it make things a little more chaotic? Perhaps. But Nancy has stayed with us many times over the years when she’s journeyed back to Ohio. My kids love her. Just as important, I think, is to shake up the status quo and expose my children to other adults with whom they have different conversations than they do with us and also different from the conversations they have with adults who don’t live with us. There are as many ways to live life as there are people living it. Many of my choices in life may not be those my children are interested in for themselves. I’d be surprised if they were. Nancy reads Whoopsie Piggle and often makes comments. After she read “What We Keep” she quickly sent me an email politely asking if we could hold off on shedding any more furniture until she returned. Truly able to let go of possessions, Nancy got rid of almost everything she owned when she left California last month, just as she had when she moved out there seven years ago. The past nine months have not been without struggle as we learn to manage a family of five children with an eighteen year spread. Now we are upping that ante for a time while our friend and her dogs stay with us. But when she leaves, she’ll clear out most of the furniture and extra housewares stored in our back garage. If we’re lucky, that is. All of this reminds me of a joke. There was a woman who lived in a small house in a shtetl. The woman was happy with her life until her widowed mother-in-law moved in with her and her husband. The mother-in-law had endless notions on how the woman could keep the house cleaner, make the meals tastier, teach the children better, and so on. Frustrated, the woman went to her rabbi and told him how her mother-in-law was making her life miserable. “Go home and move the cow into the house,” he told her and she did. A week later, the woman went back to the rabbi, more frustrated than ever. Her mother-in-law was still unabashed in her running commentaries and now the cow was making it impossible to get around the small house. “Go home and bring your chickens into the house,” he told her and she did. A week later, she again returned to the rabbi, at her wits end. “Go home and bring the goose into the house,” he told her and she did. Days later, she came tearfully to the rabbi, telling him she couldn’t take it any longer, life at her home made her despair and she didn’t know if she could face another day. “Go home and move all the animals out of your house,” he told her and she did. When the rabbi stopped by the woman’s house the following week, he asked her how she was doing. “I have never been happier,” she told the rabbi, “ever since you had me move the animals out of the house, my life has been so easy!” The woman made no mention of her mother-in-law who was sitting in the corner audibly complaining about anything she could. This entry was posted in Uncategorized and tagged finding balance in chaos, gardening, large families, life choices, meditation, Robert Frost, serviceberry bushes, Sliding Doors (movie), spicebushes. Bookmark the permalink. I love reading your blog ,Holly. You have a wonderful rich life.